About 20 years ago, knowing almost nothing about the doctrine of predestination, I listened to the CD series of this book. My Christian life was radically changed as I realized what God really did for me and much of the bible suddenly became clear to me. My love for the Father, Jesus and the Holy Spirit has grown daily since I first heard this great truth! This is a must read to all Christians out there. I've been battling the doctrine of predestination since the time my Dad shared it to me for I can't accept the thought that humans are like robots to God's enormous playground called life. But after reading this book and educated by Dr. Sproul through this material, I finally succumb to the doctrine. Now I appreciate God's grace, mercy, and love 1000 times more than before I embraced the doctrine. This is a must read to all Christians out there who wants to go "In-Depth" the word of God. I love R.C. and his simple communication of very deep subjects. I tell people R.C. Sproul is like a set of water wings. You can dive as deep as you like into the theological pool and he will make sure you don't drown, because no matter how deep you go he'll get you back to the surface. Read this in the Holiness of God, Chosen by God, and Pleasing God three in one! Awesome combo! I got this book for free with an order and set it on the shelf....it kept "staring" at me so one day I decided to read it. I was not Reformed...! This book challenged me big time. I kicked against the goads... tried to find errors in what I saw.... I read it three times and ultimately surrendered to the Biblical truths that Dr. Sproul plainly laid out before me. I'm very thankful for this great book and have purchased multiple copies to give away. Thanks Dr. Sproul! This book helped me to answer a lot of questions that I have had since many years ago way back when I was working in the Middle East. No doubt that Dr. R.C. Sproul is used by God to bring us a message to help us realize the kind of riches we have in Christ. This is the second book I have read by R.C. Sproul. First there was The Holiness of God, then this one. Both are well written, outstanding books with Dr. Sproul's special touch. I am finding that he writes this way a lot, for now I am reading The Glory of Christ. I like it too. A real service to the church. Keep up the good work, R.C.. God bless you! It changed my whole life! It was a significant event in my life, to say the least. I read it when my pastor gave it to me to explain predestination (which I was fighting against) and I only read it so I could prove him wrong. I didn't just read it, I studied my way through it, and guess what?? I discovered he was right! It all hinged on the fact that God is soverign. It's an amazing book and I'll always be thankful for him giving it to me! After being a vehement anti-predestination Christian for YEARS, I finally submitted to the truth that I see now is so CLEARLY and CONSISTENTLY taught in the Bible. I have bought several copies of this book and given it to others also struggling with this issue,and time and again they have come back with sentiments that I share--this book carefully and sensitively exposes what the Bible says about God's sovereignty,and refutes all the arguments against predestination with both sound logic/reason AND Scriptural emphasis. Concise,coherent,and a beautiful read! 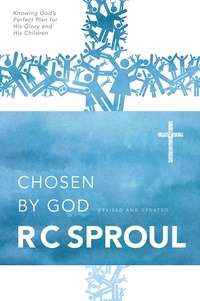 &quotChosen by God&quot is excellent and easy to read. It tells us the biblical truth about God's plan of the election of his people and the controverse &quottulip&quot. Neither can RC Sproul nor does he want to write with the brilliancy of a Martin Luther or John Calvin, that's why I give him only 4 stars. God bless RC Sproul and Ligonier ministries! The ideas covered in this book were deep enough to challenge ones preconceived views. Anyone seeking an objective presentation can receive it within the covers of this book. However, it is understood that the author has an opinion that concurs with views expressed. I appreciate the end of chapter summaries as well, they bring closure to the thoughts discussed throughout the chapter and make for a nice group study guide. Adam did what I would have done. It was a nicer refresher that solidified my belief in Predistination. &quot;Chosen by God&quot; gives angles and addresses topics not mentioned by others, such as books by Arthur Pink and Lorraine Boettner. For example, the book talks about how Adam and Eve perfectly represented us; their desires and wishes perfectly represented ours. EVERY human that has ever existed would have done exactly what Adam and Eve did because they perfectly represented us. God didn't make a mistake in who he elected to represent humanity. When Adam took the fruit, it was if I had done so. This revelation makes God's mercy and grace so much more meaningful to me. No other word but awesome! Dr. Sproul as usual does a masterful job of laying out the doctrine of predestination. I thank the Lord for Dr. Sproul and the men who serve with him to preach and teach the truth of God's Word by mouth and the pen. Did I mention that the pocket size edition of this work is the perfect size to take with you? Thank you Dr. Sproul. This book opened my eyes to Gods sovereingty. I read this book in one sitting. It is very thought provoking and worth reading. Personally I don't agree with Dr. Sproul's conclusions. I believe he, like all Calvinists, miss the clear intent of scripture by taking passages having to do with temporarily hardened Jews and applying them to a soteriology for all mankind. However, if you are looking for a clear, concise and well written book on the reformed view of salvation this is one is worth reading. I finished reading this book in less than one week. It treats the tough topic -- predestination --in such an intriguing, enlightening and biblical way that I just could not wait to see what the author would bring up in the next step. The summary at the end of each chapter is helpful to aid the readers to keep track. If the Lord will, I would like to see it translated into my native laungauge -- Chinese. I am convinced that it will help other Chinese believers just as it has helped me.